The Bloom Booster you’ve been waiting for has finally arrived! Big-N-Sticky is the ultimate finisher to increase yield while producing the cleanest and best tasting harvests on the planet. 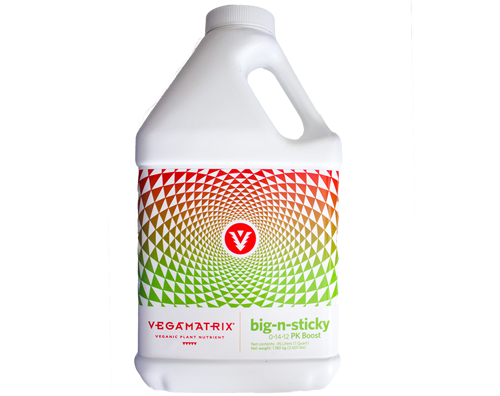 Big-N-Sticky’s rigorously tested proprietary blend of ORGANIC and synthetic ingredients create a synergistic effect which keeps all beneficial compounds readily bio-available for producing massive, resinous buds. Big-n-Stocky ensures rapid nutrient uptake of phosphorous and potassium. North Atlantic Cold Water Kelp Extract, Vitamin B-1 & Yucca Extract dramatically increase your plant’s production of essential oils, terpenoids and phenols. Big-n-Sticky is designed to produce the BIGGEST, STICKIEST, BEST TASTING buds imaginable.